According to the study by Purdue University, if Beijing applies 10% tariff on U.S. Soybeans, total soybean exports could drop by 18%. China still buys more soybeans from the U.S. than any other agricultural commodity. Last year, China bought $14 billion worth of soybean. China is the world’s biggest importer of soybean and America’s largest buyer. 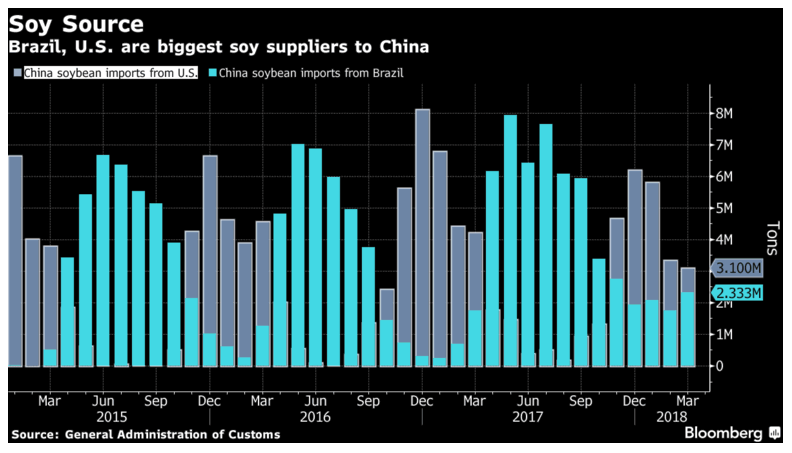 In the short term, as the world’s top importer, China can not fulfill its soybean needs without importing massive quantities of the U.S. product. China still needs U.S soybean in a few months, even next year. However, if the trade war drags on for a long time, China can look for an option which could have irreversible effects on U.S. markets. Due to the tariff, short term China will feel the pain of having to purchase U.S. soybean at higher cost in the next couple of months. The higher price that China needs to pay however is somewhat offset by the declining Soybean Futures price. 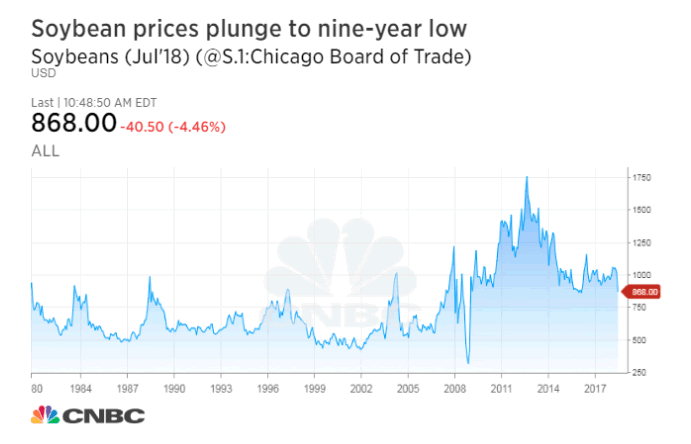 U.S farmers on the other hand are also feeling the pain with soybean futures price near 10 year low. In the long run, depending on how long the conflict persists, the unintentional result can be that China can adapt without U.S soybean. Daily chart of Soybean Futures (ZS_F) shows a 5 swing incomplete sequence from 6.10.2016 high, favoring further downside. Please note that this 5 swing does not refer to well-known 5 waves impulse in Elliott Wave Theory. Rather, it’s part of a 7 swing structure, which is also known by the name of double three Elliott Wave structure (WXY). 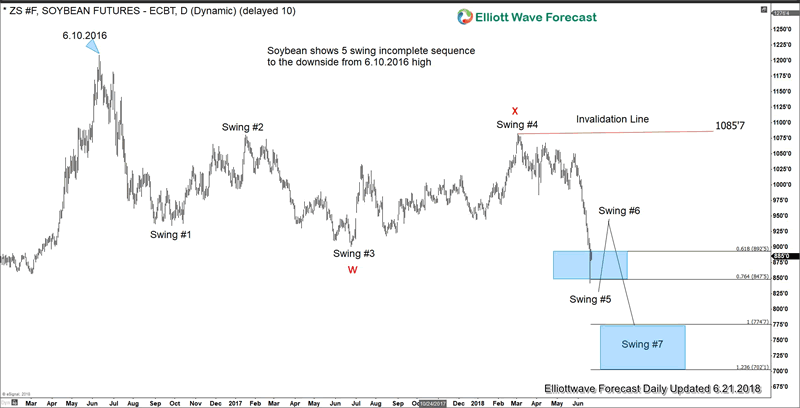 You can learn more about this special structure by watching the video “How to trade WXY Elliottwave Structure.” Soybean Futures is expected to bounce in swing #6 and as long as the rally fails below swing #4 (1085.7), then it’s expected to extend lower towards 702.1 – 774.7. So the price per bushel target is $7.02 – $7.75 approximately. If you are interested to see Elliott Wave analysis on Soybean or other commodities, forex, and Indices, you are welcome to take 14 days FREE Trial, You can check our service and get Elliott Wave chart updates in 4 time frames, live session, and signal service (live trading room).